The Hydra Smart Bottle is a revolutionary piece of technology and heralded for its attention to detail. This is a power-packed water bottle that incorporates the use of precision engineering and high-tech features for an improved experience. Grabbing a water bottle has never been more exciting than it is now. This is a "tech" bottle that does it all and does it well. Want to listen to those beautiful jams on your phone? 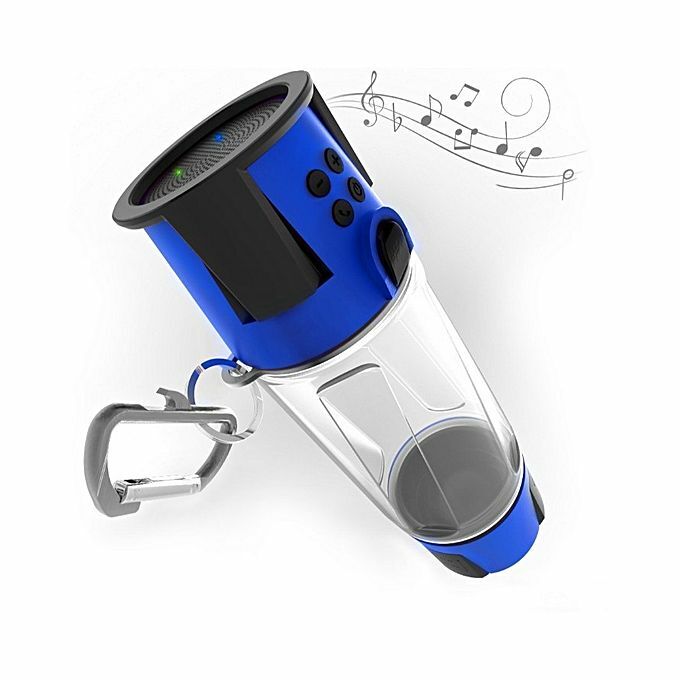 This bottle is equipped with a top-tier rechargeable 5W Bluetooth speaker for a wide-ranging auditory solution. It's a wonderful addition to the daily commute as one can quickly connect via Bluetooth and stream music in a matter of seconds. For those without a certified Bluetooth device, it's time to bring out a traditional headphone cable and connect it via the headphone jack. To make things easier, the Hydra Smart Bottle comes equipped with a customized cable! Take the opportunity to play music through the speaker or listen to your favorite radio station using the local FM radio. This is a powerful speaker that offers crisp audio for users as they go about their daily routine. Whether it's a simple jog through the park or an intense workout session, the speaker will always be ready to go. Can't seem to find an outlet nearby? Is your smartphone starting to run out of battery? This can become a problem without the right solution in hand. For Hydra Smart Bottle owners, charging a phone is never a problem. The bottle comes fitted with a world-class 4000 mAh power bank that's easy to use, engaging, and incredibly powerful all wrapped into one. All it takes is the use of this power bank and the accompanying 2.1a USB output for the device to be charged. For anyone that needs a bit of power while on the move, the Hydra Smart Bottle has a ready-made solution. 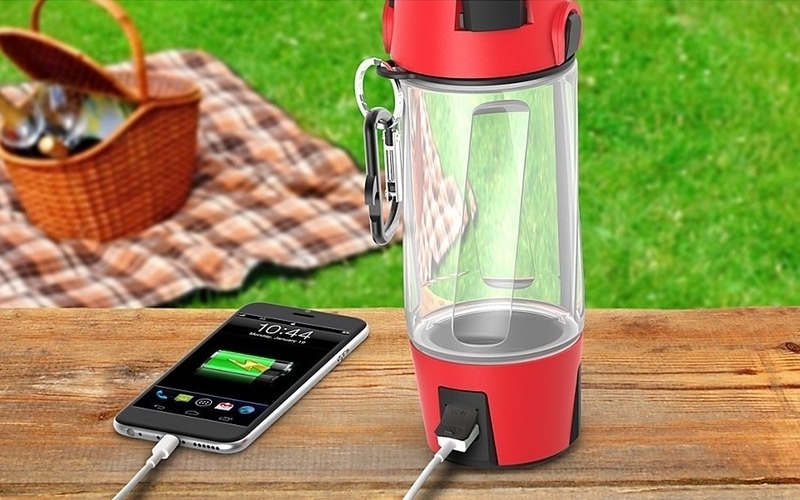 Whether it's a smartphone or an MP3 player, this smart bottle will be ready to charge. Heading outdoors in the night can be a fascinating experience but also one filled with danger. To avoid getting hurt, the Hydra Smart Bottle offers an all-in-one solution with a built-in indicator for users. The bright flashing red lamp ensures everyone is aware of your presence whether it's cycling or taking a stroll through the neighborhood. 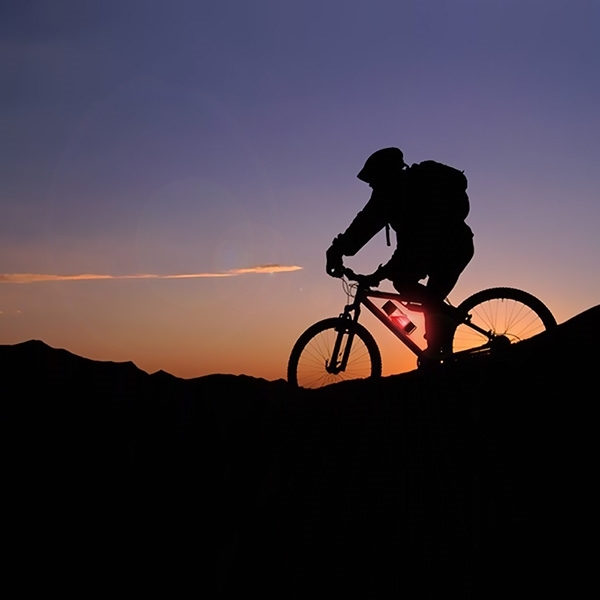 The light is visible, easy to operate, and offers incredible versatility during the darkest of nights. Turn on the bright red light and feel safe as you roam around from place to place. Imagine having a phone call come in while holding the water bottle. This bottle provides a robust option with the inclusion of a well-positioned microphone. With a simple press of a button, the phone call will come on and you will be able to communicate with the other person. This is a brilliant solution that makes taking calls a breeze. The microphone is able to offer a flexible option while moving around. There is never a good reason to fiddle around with the wrong buttons or carry extra equipment when you don't have to! It's hands-free, quick, and incredibly safe to use. Just like the traditional water bottle, this wonderful solution is built to keep you hydrated. With a 20oz capacity (600ml), this is a well-sized water bottle with ample room for water, juice, or whatever else your taste buds enjoy. Staying refreshed is important and the Hydra Smart Bottle provides a lot of flexibility to users. Whether it's hiking, biking, or jogging, this water bottle will help keep you hydrated from start to finish! The Hydra Smart Bottle is a lot more than a high-tech solution. 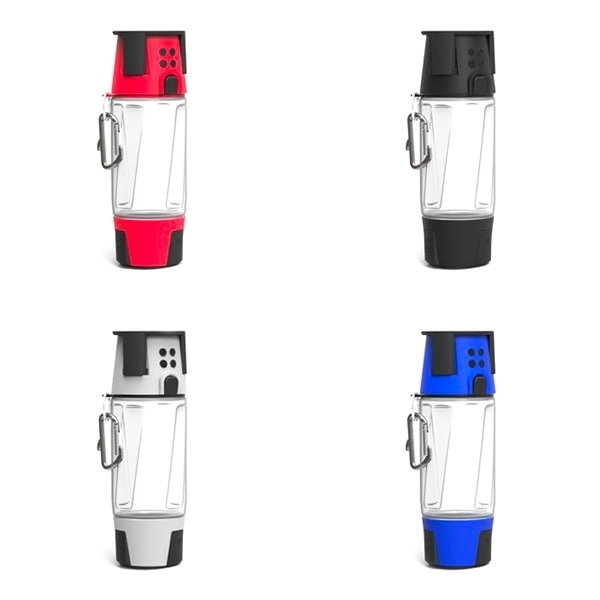 It is an eco-friendly bottle designed to provide a well-rounded and modern solution. Instead of dealing with traditional or plastic water bottles that are unsafe for the planet, this BPA-free product is the ultimate option. It has been designed by some of the world's finest engineers with a focus on eco-friendliness. It has passed years of testing and continues to remain the perfect BPA-free solution for your hydration needs. Keep 20oz of water inside the bottle without having to worry about chemicals, additives, or any other issues. This is a product that encourages users to stay eco-friendly and understand the beauty of staying healthy. With the inclusion of a free app, users are able to turn this high-tech water bottle into a dream come true. The Hydra Smart Bottle is built to offer something unique, user-friendly, and beautiful which begins with the assistance of its app. The app is able to provide a wide array of features including the use of specific sounds before going to sleep. These sounds can include camping crickets, the summer rain, or even the ocean waves. Whatever you fancy, this app will be able to play. The water bottle also encourages you to stay hydrated throughout the day. Whether it's early in the morning or right before going to bed, the water bottle will be there in all its glory to offer a quick drink. 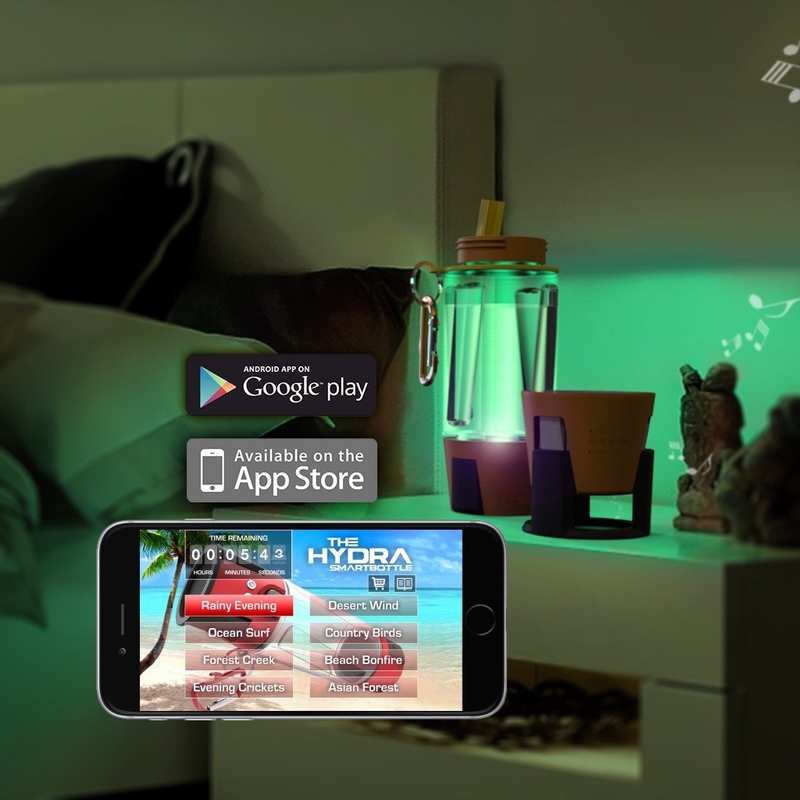 Along with the bright red lighting for safety reasons, the Hydra Smart Bottle also comes with a world-class set of additional lighting options. 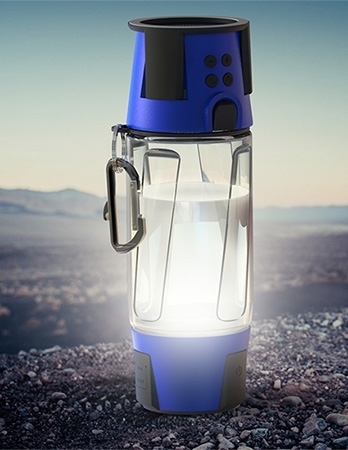 For those looking to use their water bottle as a lantern or flashlight, the standard white light is an absolute joy to use. The white light will fill the darkness and illuminate everything in its path. The Hydra Smart Bottle also comes along with a rainbow setting that offers a unique option for those days when you're partying! Want to give it a quick wash before using it again? Pop it into the dishwasher and don't worry about anything! This is washable and will not give problems. 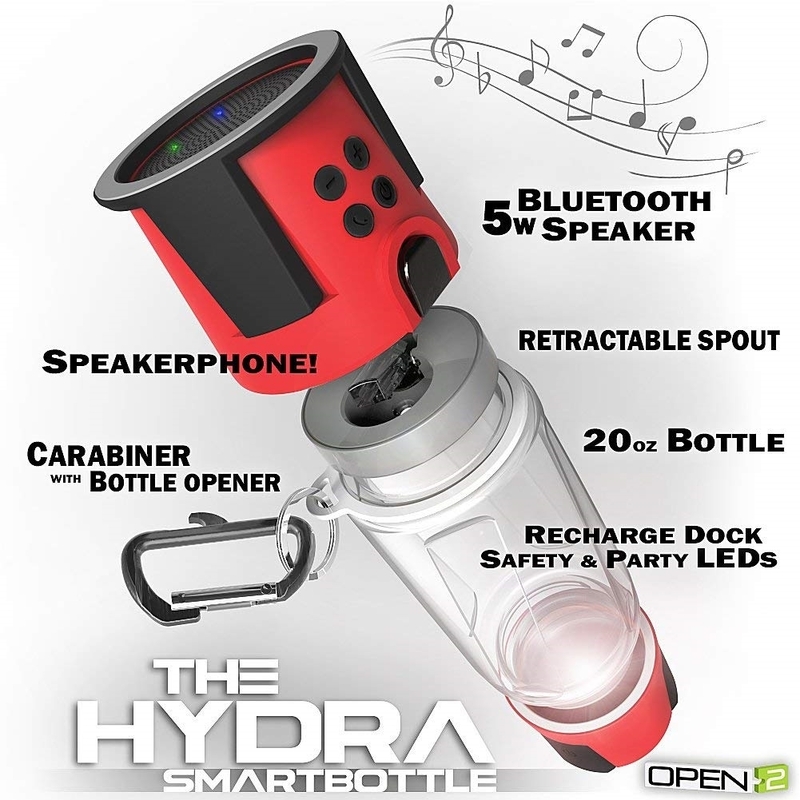 The Hydra Smart Bottle is an example of detailed craftsmanship and engineering. It has been designed with the purpose of being modernistic, fun to use, and beautiful to look at. It does it all and is the ultimate prize for those hoping to make hydration important again!